Well, that block you quoted me on was mostly pointing out all the details of reality that we don't really need to see in an RPG, then the very easily-simplified ones that I think would work well. Hence the comparison of food selection to ammo selection. People hear "food" and "cooking" and shout "ultra-complextity! ", but you say "hey, lots of different types of ammo! ", and people just say "YAY! AWESOMENESS", rather than "Hmm... I think we should really just assume your people can acquire ammo. They're not going to go into battle without arrows. Let's just leave that out of the gameplay, shall we?" Double-standards, if you ask me. I agree, I do like multiple types of ammo but that is generaly because they can then do other interesting things, like a fire arrow shot from a Sonic Bow causing Arrow/Fire/Sonic damage (yes I did that in one game) but I personally find that many of the food mechanics are overworked and add a level of micromanagement that is a little too far. I would say Normal ammo is 'unlimited' in that you can just have it, like being fed and watered, but Special arrows are a limited resource that you need to conserve and craft in your Stronghold. I agree, which is precisely why I'm advocating a specific approach to food, and not just the sheer inclusion of some unknown manner of food mechanic that could be just as overworked and micro-managey as in many other systems. I was going to say that I'd rather have normal ammo still be limited, BUT... with the spells-per-day system (at least in P:E), your lowest-tier of spells is unlimited use. So, I could see basic ammo being abstractly unlimited in nature. However, when I say basic ammo, I mean basic. Like small rocks you find on the ground for a sling, as opposed to metal bullets of the appropriate weight/shape, etc. Very basic arrows, as opposed to nicely-crafted razor-sharp steel arrowhead arrows. Etc. Basically, if it were going to be unlimited like that, I'd want the unlimited ammo to be to special ammo as the unlimited spells are to the non-unlimited spells. So, if that 3 fire damage spell, Scorch (made up just for example), is unlimited, but 8-10 damage Magic Missile is not, then I wouldn't expect an Archer's basic, unlimited arrows to do 10 damage. That sort of thing. *shrug*... On that note, I'm also cool with your arrows being limited, but it being understood that you retrieve the majority of them after combat has ended. So that they're per-encounter replenished, also much like a category of spells/abilities in P:E.
Anywho, I'm vying for food (IF it's implemented) to work in a similar manner. You have unlimited "this prevents me from dying" food, as it's understood you gather berries or carry around a cracker... who knows. So only the food above-and-beyond basic stay-alive food would be managed, in exactly the same manner that you would have only the arrows that are above-and-beyond basic shoot-things-with-my-bow arrows would be managed. So, with that in mind, specifically (and not just thinking of random other food systems that sucked in games), I invite your thoughts on this. Exactly. The flaming arrow costs something and/or is limited in nature (if you found it and it "didn't cost anything," even though it technically cost the effort of finding it; killing something, opening a chest, traveling TO that thing you killed or that chest, etc. ), therefore you have a choice as to whether or not you buy it, or obtain it, or sell it, or use one this fight, or 10 this fight, or save them for later, etc. You could have food produce choice-worthy bonuses, as well. Make it relatively rare (to find good enough foodstuffs that it actually provides a significant enough bonus to represent with mechanics), and now you've got a significant choice. Between what to eat when, and when to rest, etc. It would be a minor thing, but it could easily provide some benefit and layering to the system without causing a bunch of trouble. It also gives various skills and such an additional purpose. High survival skill or Knowledge: Flora? Your character can locate beneficial berries and/or other plants to directly eat and/or cook with, so the next time you camp, you can cook a meal of +5% stamina regen as opposed to just a regular meal that keeps you alive. Or maybe another foodstuff grants +1 to initiative rolls until you rest again. Etc. Do you want the initiative bonus, or the stamina regen bonus? You can't have both. Alas, choice. And yet, if you DON'T have a +1 to initiative rolls for the next span between rest points, the world doesn't end. And thus, if you don't have a character with ultra high Survival skill to find those berries, you're still fine. As I said, minor stuff. I'm not talking food that has the same impact as which weapon you have, or what abilities/spells you use or something. I'm not in favour of micro-managing the food supply, but if it's mostly abstracted and you can choose "forage for better food" from your 'survival' skills, which then adds a rest-bonus, I think it'd work ok.
Let us remember that buffing as a game mechanic isn't all that desireable. In small doses and as a limited option to use before fights you anticipate as difficult it is okay. But in many RPGs it either became a ritual before every fight or was ignored completely because it was so repetitious. Granted there are ways to make the concept slightly interesting by providing buffs that help only against specific enemies and you have to think ahead what monster is likely around the corner. But for example a stamina-buff is never specific and just a bad method to keep the player occupied without giving him something fun to do. In general it is hard to make buffing fun. Do we agree on this? Now we are talking about ideas to make food interesting by (amongst other things) giving us small buffs. In other words, bending a basically uninteresting daily task into something interesting by adding buffs which are tending to make a game less fun on average. That is not the right direction in my opinion. Other tangents to make cooking interesting may be ingredients-gathering or finding/creating recipes. If you are getting a deja-vu, you are right. We usually already have potion-making/herbalism and crafting in games to fill these niches aka to employ these mechanisms. So cooking would be somewhat redundant and only interesting if potion-making or crafting were very limited or had somehow fundamentally different mechanisms. Edited by jethro, 07 November 2013 - 03:50 AM. I agree, buffs made combat entirely unfun for me in DnD. I get that they were part of the game, but you basically HAD to buff, you HAD to have a counter to buffs, or you HAD to wait out enemy buffs. Mostly it was because the buffs made some characters untouchable. I'd rather buffs give benefits which are helpful but don't shield characters from normal, UN-augmented combat. Buffs that don't provide direct armour or health or saving throws boost, but rather things which decrease ability cooldowns, increase attack speed, speed, increase status effect duration on enemies or decrease it (not cancel it) on allies. What I'm saying is you can fix buffing without removing it. +1 It's one of the things that got out of hand in D&D, and in CRPG-versions of it, this reached an absurd extent as you levelled certain characters. May I add that the characters looked like lit up Christmas trees? It took quite some time if you had a party of casters and you wanted to buff before a big encounter. I'm praying that Josh & Co has solved this issue. I disagree. I find buffing as much fun as attacking an enemy. I don't see any differences between clicking a button to attack someone or clicking a button to buff. I like to play support characters/have them in the group. That's why I like the concepts for chanters and paladins. Having a short duration stamina buff is in my opinion a good idea, if you use the spell you can't use a different spell/ this spell later so it's tactical decision. The same decision you would make if you use an attack spell. A lot of the longer-duration buffs can only be cast in combat, so pre-buffing isn't an option for those abilities. Edited by Prometheus, 07 November 2013 - 09:56 AM. I commend you, sir, for being constructively against the specifics of previous suggestions by actually contributing a "how COULD we make it better, though?" after voicing your dislike. You say buffs, I say factor modifiers. You could really look at any factor modifier as a buff. "Oh, hey, if you equip that sword against light armor instead of that mace, you get a damage buff. And if you equip that mace, you get an armor penetration buff! If you send your archer to high ground, he gets a range buff!" Honestly, I blame the oversimplification of such things that has led to all the MMO terminology. . Not that "buff" was necessarily invented by MMOs (I'm not sure), but it's heavily used in that same library of terms. And those terms overly generalize entire aspects of design (such as factor modification) into a simple, bland thing, so that every time you think of something similar to a buff, you can't help but think about a spell you cast before every battle in a chore-like fashion to make sure you have all the best numbers under-the-hood for combat. But, I DO agree in the same way JFSOCC did, and I agree with him. You're wrong that "buffs" are the wrong way to go, in that I don't think altering factors is inherently lame or bad. However, buffs as we know them are not always very splendid. Like JFSOCC, I think it would be best to fix the wonky design details rather than abandon an otherwise valuable facet of design. We probably should have defined the term "buffing" before we started discussing about it. Especially I should have since I don't have much against spells/abilities that you can only use during combat. Especially if they are concentrated on specific (support) classes. If I find the support class too simple I can always switch to a different class. No, I'm specifically talking about what Josh called pre-buffs. Because they don't take time off your fighting time, there is really no reason not to do them and so it always is done. I would name Stoneskin as an egregrious example. In NWN2 it was nearly mandatory to put Stoneskin on your clothies after every rest. And if you wanted to be thorough, a few long-duration buff spells as well. Naturally if all combat-buffs are no-brainers it gets tedious again, but there are easy remedies: Combat buffs with short durations have to be used at the right moment. Combat buffs against specific attacks or spells/spell families help only if that attack or spell is likely to be used shortly. So, can we agree that pre-buffs are bad? At least if their use has no disadvantage? Then obviously you would take them all the time. Making them a chore if you have to do something to get them and static noise in the background if you get them automatically. Well, here are two ideas: By getting them automatically they at least don't seem like tedious chores. And if they have disadvantages (real ones, not whimpy INT-1 for the fighter) then their selection is tactical again. Now, to get back to food, it should be evident that food has to be on the pre-buff side of buffs. Which makes it hard in my opinion to make it fun. Edited by jethro, 07 November 2013 - 04:17 PM. But seriously, I'm at least with you in that I don't think combat snacking should be implemented. Outside of combat, I'm really not sure what the best thing to do is. Maybe the occasional magic sandwich that is actually just a fancy potion (masquerading as food), but it still looks like long-duration buff territory. Whether or not that is bad is not a discussion I want to get too involved in. I just still see that as a bit of a narrow-minded view of a bunch of stuff generalized into "pre-buffs." I mean, resting at the stronghold is going to "buff" you. But, it only does so after resting at the stronghold, and only according to what you've put your money into there. It's not a pre-buff, because you can't go rest at your stronghold before every single thing you do. You can do it whenever you get the chance to return to your stronghold, but then, you're going to be resting anyway (for the healths), so it's not as if it's just something to do to get a buff. It's getting an added bonus when you do rest, which you will have to. When you rest at the stronghold, that is. Pre-buffing is so bad when it's completely managed by the player, 24/7. You never DON'T want to have that extra Stoneskin AC, or extra weapon damage or accuracy, etc., so you actively prep your party to its maximum every time you're going to go into battle, (if you can, and in a lot of other games, you can). But, if food is linked to your rest cycle, then you can't simply stop and eat a snack to get some bonuses. Therefore, again, it's a conditional bonus. If darkness lowers stealth checks, then you could conceivably wait until darkness every single time you needed to perform some kind of stealthy task, and then consider the sheer condition of darkness to be providing a pre-buff. Would that mean that darkness affecting stealth is a horrible idea? I don't think so. You could even have a timer on food usage (depending on how resting is handled -- if resting automatically passes 8 hours or something, then that would be moot, since food would be linked to resting, and resting would already progress time sufficiently). If you just rest for an hour or so, then you wouldn't actually get to eat food every single time you rested, so it would be an even more gradual bonus, but one repeatedly utilized throughout the game nonetheless. Got someone with excellent Survival skill? You have much greater chances of finding quite-beneficial plants/meats and such when you DO sit down to eat during a rest, so you get access to more different types of food bonuses when you do occasionally rest after a certain amount of time has passed since your last meal. Again, all abstracted away and handled automatically. The only thing you choose is what to eat (out of what's available -- also dependent upon choices) when your party is hungry and rests. So, it would simply be another layer. And you could have some rather interesting effects of foods. Maybe one improves move speed slightly for the next few hours. Thus affecting the positioning aspect of combat. Maybe you know there are going to be speedy creatures in the region you're about to traipse through, so you eat that food. OR, maybe you go with some other bonus that you have, because why not? You're the one coming up with your strategy. Nothing says speed is the single best answer to faster enemies. *shrug*. It's just an example. There are numerous, numerous ways of doing it. All of the above details can be tweaked and altered. It's not about the specific results, but the idea, and what kind of layer that COULD add to the system. I don't know everything there is to know about everything else in the system, so I can't say "this would be the greatest addition to the game, ever, DEFINITELY! ", but nor can I rightly say "this would definitely just be lame pre-buffs, and would make the game worse." I'd much rather hear your breakdown of why my examples would be problematic in nature, and why you can't come up with any ways around that, than just how much pre-buffs in other games tend to be lame, and how that's one potentiality for some kind of rest-meal implementation in P:E.
The stronghold buff is definitely a pre-buff. It just isn't tedious usually because you don't have to do repetitious tasks to get it (as I said, this is one of the remedies, but it also makes the buff a bit superfluous). The only time you will ever have fun with this buff is when you proudly buy the facility in your stronghold to get it. After that it is just something you incidentally have if you recently visited the stronghold and it might make you hold off resting for one further fight because you want to still have the buff. The moment you actively go back to the stronghold only to have the buff for the next fight it becomes slightly tedious. The only good reason for the stronghold buff is (besides the meta-reason of having something to throw money at and give the stronghold a justification to exist) that you might encounter a fight that is so hard that you need every last bit of help and decide to make a stopp-over at the stronghold to get the buff. Sorry I'm so negative about this. I don't see a way around the problems and I think I showed why any conventional solution is bound to fail because of fundamental reasons. So in my opinion, if you want to bring food into the game, forget buffs, think about something completely different. This is one fantastic update! Again you could view almost anything that conditionally provides a bonus in exactly the same light, if you wanted to. Armor. The only time you will ever have fun with the extra DT "buff" is when you proudly buy the armor to get it. After that, it's just something you incidentally have whenever wearing that armor. The only difference is that it doesn't wear off at any point. But, you might find better armor, though, or "need" better armor for some tough fight. The moment you actively leave that fight to go back to town to buy new armor just to have the benefit of bonus DT protection, it becomes tedious. Resting. It "buffs" your spell ammo. So, maybe you run back to that rest location to have 10 spells instead of 9 at your disposal, for that really tough fight. Tedium. See... you're looking at the only possibly dynamic of this as being your active use of the stronghold resting bonuses because you NEED them. You don't NEED a training yard at a stronghold, but you can buy one, and then you get a bonus. You don't NEED mithril plate instead of steel plate, but you can buy it, and then you get a bonus. You don't NEED any specific Talent you can take from a given list of options (all of which you cannot have, because you only have so many total points with which to choose), but you can take any one of them, and you get that bonus. Sorry I'm so negative about this. I don't see a way around the problems and I think I showed why any conventional solution is bound to fail because of fundamental reasons. I'm sorry you're so negative about it, as well. But, it's your choice. You can feel like these types of things are all terrible decisions and they can't ever be good things, if you'd like. I had just hoped to at least convince you of the possibility of doing them better than we've seen, and of how the inherent qualities of their sheer existence do not make them bad. So you wouldn't have to feel so negative every time you thought of things that are already in the game, even, like the stronghold resting bonuses. If we disagree, we disagree. But a possibility is a possibility, whether it's my preference to focus on it or not. The stronghold buff is definitely a pre-buff. [...] The moment you actively go back to the stronghold only to have the buff for the next fight it becomes slightly tedious. Oh sure, finding the armor is the fun part, after that it is the status quo. But it doesn't matter because you don't have to do any maintenance with it. It isn't exactly comparable to a pre-buff because the benefit is permanent as long as you wear it. I added the "tedious" sentence just for completeness sake, aka if you as the player turn it into an actively maintained pre-buff you also probably are ruining your own game experience. I don't mean that the stronghold buffs should be scraped, they are exactly how they should be and do what they have been created for. They are no-maintenance pre-buffs but also their actual influence in the game is very limited, but that's how it must be. You can feel like these types of things are all terrible decisions and they can't ever be good things, if you'd like. I had just hoped to at least convince you of the possibility of doing them better than we've seen, and of how the inherent qualities of their sheer existence do not make them bad. So you wouldn't have to feel so negative every time you thought of things that are already in the game, even, like the stronghold resting bonuses. As I said we just have a misunderstanding about the stronghold bonus, hope I could correct that. My point about pre-buffs is really that a normal RPG automatically has a high degree of buff mechanisms that need to be there that there isn't much room for more, especially the (somewhat "toxic") active (i.e. activated by the player) pre-buffs. As soon as you have a variety of spells you have combat buffs and often a few pre-buffs as well from that. In PE you also have resting buffs, stronghold buffs, surely potions. Like in many other normal RPGs. If done well, they are just the right amount, but it is an easy to apply mechanism, and designers easily fall into the trap to put too much of that into the game, especially with the spell system. There just isn't any room left for food pre-buffs in any normal RPG. It's like salt in supermarket pizzas. They usually have a good amount of salt. It is easy to add salt and it is used quite liberally by pizza manufacturers. If you want to further add salt use it very sparingly, it already is at the limit and it is even detrimental for your health. Better, just don't. Edited by jethro, 09 November 2013 - 06:46 AM. No no, I understand. To put it simply, the thing about buff-type things is to use them sparingly, much like seasoning (good example). I'm only trying to encourage thinking regarding the possibility that there are methods by which to allow food to be a factor without oversalting the pizza, so to speak. Look at stances. The ones that bestow some kind of benefit and detriment, and are not resource dependent, or duration-based. They are simply mutually exclusive. You can activate a different one, but only by DE-activating the current one. You could use none, I suppose, but the system is basically designed to assume that you're going to use one of the given options at any given time. They aren't really a "bonus," so much as a "difference," because "stanceless" isn't the norm. The norm is simply a stance, whichever one you want to use. Then, you have restrictions on swapping, so you can't just insta-juggle them to get whatever different factor values you want at any specific moment. So, the decision of WHICH stance to use is somewhat preparatory, but it's hardly a pre-buff. It's not a temporary thing that you always need to set just before going into battle for maximum effect. Yet, you might need to make the significant choice of CHANGING it before engaging a certain group of enemies. Same with weapon types. You might need to whip out your crushing weapons (for example) for maximum effectiveness against a particularly tough group of foes with a high resistance to most other stuff. The thing with food is, I don't think it would be the end of the world if you did have some kind of long-term duration on them. But, that would really depend upon the distance between rest points and such, so I can't even begin to decide whether or not there should be a duration, or how long it should be. But, does that make sense? Food could (the key word here) offer a variety of bonuses that the typical stronghold/inn-resting wouldn't. I mean, food isn't going to tread on the hedgemaze's territory by boosting your Stealth. "This sweetroll makes my footfalls quieter! 8D!" So, yeah. I don't think it's some kind of automatic oversalting, just the sheer possibility of food being in and granting "bonuses." You could have findable food be rarer/expensive or whatever, with some form of cooking/survival/other skill offering you a greater variety of options more often, rather than just downright "better and better" bonuses. Interesting bonuses. It's just a possibility. Just as the addition of food overdoing things is. I simply acknowledge both, and choose to explore the former as much as I can before ruling it out, rather than exploring ways in which it could be ruled out. To me, ways in which it could be ruled out are simply ways in which NOT to do the mechanic, not reasons why it shouldn't be attempted. So, I'm late to the party. Probably too late. But here's my two cents. Okay, I've thought a bit about what kept me unsatisfied/worried about the player stronghold preview and I think I've been able to pin my worries down by now: the preview, well, it's less than stellar on several levels. Yes, I know that's harsh, and it is not meant as an accusation against the people who do the modeling and rendering, and I apologize if I've just insulted them. However, having said that, here's my reasoning for being so critical. The problems are on the conceptual level. Project Eternity and its background try to present a world rooted in what I'd call magical realism (it's fantasy with magic and monsters, but adheres to basic RL logic), a world that's going through a political, economic and technological transition. 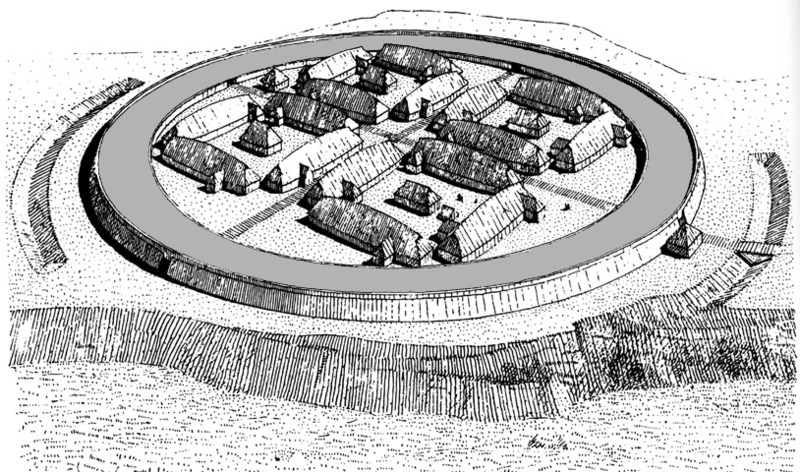 There's a been a war, there are still tensions, and the placement and design of fortifications and settlements should represent as much. Even if we don't go with the full medieval European design there are a few basic functions any stronghold's placement would come down to, regardless of cultural and/or time period inspiration: border protection, trade route protection, vital landmark protection (river ford, mountain pass, etc. ), settlement protection. From this also flows its general design. Example? Crossroads Keep from NWN2. It presides over a crossroads, a junction of trade routes. What it does needs to be represented in the general map layout (what is its basic function?) - is it watching over a river ford, is it controlling a trade route, is it the administrative center over nearby villages, etc. - as well as it needs to show in the keep's own layout (design). What the stronghold has to have is an ingame meta-function that goes beyond player stronghold. It needs a raison d'être, a reason why it's there in the first place! What we have here is just an artificial hodgepodge of elements that, by and large, have no right to exist there in the first place. You need to decide what this place's original meta-function was/is and develop it from there on. Because right now it's just a shambles of disparate elements that are placed there because you want them, and not because they make any kind of in-game sense. I know that what we see is a WIP, so my critcism can only be limited and based on the elements we are shown here. And there is one thing that holds true for almost every interpretation of a stronghold: Inside the walls space is a limited commodity. Is it a noble's manor? Then why is the house we see on the upper right corner so dull and small, and why is the place so heavily fortified? A manor isn't a fortress; it's a place where you live your everyday life in the highest possible amount of comfort. Too few houses spread too far; no obvious craftsmen; no seat of power. Now, settlements don't need to have seats of power, but since it's supposed to be your settlement... Take this here, for example. It's pre-medieval but conveys the idea well enough. Houses are clustered closely together to save space. The larger the space, the more able bodied men are needed to defend it! Limited agriculture is done inside the courtyards of each house cluster. This holds true to an even greater extent for walled medieval/renaissance-era settlement. The thing you have to ask yourselves is "What was this place, and how can it become what we want it to be?" Right now the apparent logic simply seems to be "We want a player stronghold with pre-existing accomodations for different races and classes." What needs to be established, however, is why such a place exists right there in the first place, and why it exists in its current form. So, what does this mean for the general design of the place? First, lets sum up what we have so far: you have to make up your minds why this place is where it is for what reason BEFORE the player becomes the owner. What was its original function, and does what we have fit that description? Secondly, how can you achieve what you want without it looking as - sorry guys - ridiculously stupid as the images above? And the most simple and versatile alternative here would be a tower keep sitting on a rock spur above a river ford. You can literally use that for everything. Want a maze? Nearby woods. A place for bards to perform? Your great hall or a tavern at the foot of the hill. You're a mage? Then this is your mage tower. Fighter? Noble. And each of those variants can be mixed, and your stronghold can expand organically to fit them. It also allows for enough accomodation inside to house your companions, and offers enough of a reasonable location to have mini-quests, battles and you doing "administrative" work. Whatever you do, please promise me it'll make more sense than what you have now. 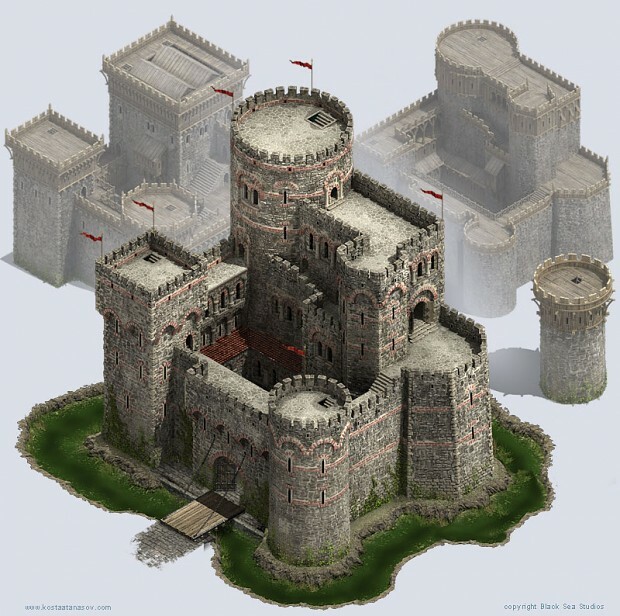 That fortress (Krak des Chevaliers) picture is all kinds of awesome. Imho PE stronghold should somewhat resemble The Friendly Arm Inn. It's a nice hybrid, blends nicely majority of the ideas laid out by Posbi. I'd either drop the walls altogether and call it a mansion or keep the walls and replace the central building with something more imposig and call it a fortress or a keep. Edited by Solviulnir the Soulbinder, 05 December 2013 - 05:54 AM.